Greek bailout money goes to banks and corporations – who would have thought? Earlier this week (May 23, 2016), the Greek public opinion polling agency – Public Issue – published its latest Political Barometer (No. 156) which reported on – Attitudes towards the European Union and the Euro. As at May 2015, the majority of Greeks polled did not believe that the EU has a future and a rising proportion now believe things would be better off in 1-2 years if Greece exited the euro and introduced its own currency (32 per cent as opposed to 18 per cent 6 months ago). Things are shifting. I also wonder what the next polls will say when the Greek people learn of the latest research that shows where all the Greek bailout money has gone? It is an appalling story really. The latest Greek opinion poll results are very interesting and reveal that the smug political elites who took for granted that the Greek people would resist exit from the dysfunctional Eurozone might be in for a shock in the coming year. The latest survey for May asked a series of questions about Brexit, the future of the EU and the benefits of a new currency (exit). Here is a summary of the results. Question: Has the European Union a future? So a majority of Greeks polled do not believe the EU has a future. The survey also asked questions about the Euro and the possibility of reintroducing the Drachma? Question: If Greece left the euro today and returned to the drachma, what is more likely to happen. Things will in 1-2 yuear be rather better, rather worse or not change much? Popular opinion, especially among the German population is that the Southern Europeans are to blame for their problems. In the case of Greece, the view is that they cheated their way into the common currency, refuse to exert discipline on their public spending, refuse to pay taxes, and are lazy – prone to siesta. For non-German reading readers – Merkel was attacking the early pension age and leave arrangements in Greece, Spain and Portugal. This article is interesting – German public opinion is caught between scapegoating Greeks and love-bombing them. But the ‘lazy southerners who do not work hard enough’ has been an on-going narrative for those who have tried to justify the vicious austerity that has keep the nation in depression for around 8 years already, with no end in sight. 2. I wonder what they will do with the new building. In the latter blog, I posted this graph, which comes from the OECD and shows comparative data on working hours. Greek workers worked 2120 hours in 2008 while the German worker on average worked 1430 hours. The OECD average was 1764 hours. So they are not that lazy (at least in relative terms). Portugal’s workers also work harder than Australia and a lot harder than the Germans. And spare the thought … even those lazy latino Spaniards work harder than the Germans! The title of this section is taken from an EMST White Paper (No. 16-02) published this month by the European School of Management and Technology (ESMT) in Berlin. The paper – Where did the Greek Bailout Money Go? – was written by the EMST researchers Jörg Rocholl and Axel Stahmer and makes for depressing reading. 2. Where did the money go to? The researchers produce this graph (Figure 1) which traces the first and second bailouts which taken together summed to €215.9 billion. The breakdown is obvious – Only €9.7 billion actually went into the Greek fiscal balance as ‘stimulus’. That is less than 5 per cent of the total funds went to help the Greek economy recover. It is no wonder it kept going backwards. Of the €215.9 billion disbursed under the first two bailout programs, €183.9 billion came from the EU and the rest (€32 billion) came from the IMF. The study does not trace the €86 billion that was promised under the third bailout in August 2015. 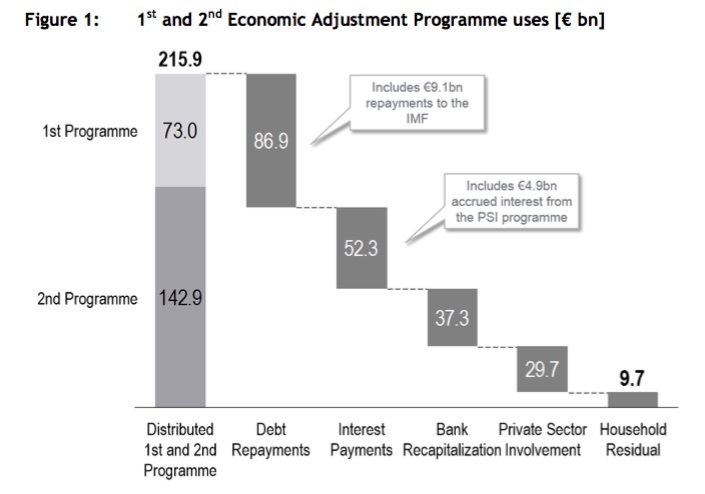 However, they suggest that the “major part of the programme serves again to cover the debt repayment and interest payments to existing creditors, this time mainly the European Central Bank (ECB) and the IMF”. 1. “€86.9 billion were used to repay maturing government debt”, which included €9.1 billion to the IMF. 2. “€52.3 billion were paid for interest on existing government debt”. The researchers also do some interesting calculations on the PSI component. European banks failed to have adequate capital to justify the lending they engaged in. The old saying is apt: Privatise the gains, socialise the losses. Now the Greek government (people) are in debt to the ECB and the IMF and the gluttonous European banks have been secured by the bailout funds. For six years Europe has tried in vain to put an end to the crisis in Greece through loans, and keeps demanding ever harder measures and reforms. The cause of the failure obviously lies less on the side of the Greek government and more on the planning of the bailout programs. The point is that Greece urgently needs (and has done so for the last 7 years) a major fiscal stimulus. Piling up more debt obligations on the government and forcing it to cut net spending even further is counterproductive and extremely damaging. It has surprised me how long it has taken for the Greek people to begin to change their opinions about Europe and the Eurozone. The polling data is now revealing a strong trend towards favouring a return to their own currency and a lack of hope in the European Project. Political developments across Europe are reflecting that this sentiment is not confined to Greece. The Austrian Presidential elections have altered the mainstream politics in that country which has nearly gone with a far right lunatic. The European elites have created a monster which is steadily coming hometo haunt them. The problem for the Greeks is that the political party that might have steered them out of this mess – Syriza – has turned into a pack of surrender monkeys who now do the bidding for the neo-liberal elites (banks, corporations) and further undermine the prosperity of the Greek people. The problem then is that parties like Golden Dawn become the vehicle to channel the anti-euro sentiment and merge it into other sentiments that are less than desirable. Germans are not like Anglo Saxons I was told in Barcelona the other day by a neo-liberal critic of my book. They apparently follow the ethical position laid out by Immanuel Kant – the so-called Kantian Ethics which tells us (in simple terms) that we should always do the ‘right’ thing (avoid a ‘known’ wrong) even if the action causes harm (a ‘potential’ wrong). By acting according to our duty (‘good will’) we are free from blame for bad outcomes. We should never question rules even if questioning them would lead to better outcomes. The Southern Europeans are apparently prone to breaking rules and taking politically expedient decisions which lead to corruption and inefficiency. I reported some clear examples of Spanish political corruption which I encountered while visiting Valencia recently in this blog – Spanish El Pacto – A Syriza Reprise!. I am aware of major public corruption elsewhere in Spain (for example, Madrid). I don’t want to see that taken as meaning that the Southern European nations are riddled with corruption by a lax system of public oversight and a blind trust that the self-regulating market will do the right thing. Far from it. The self-regulating market is a myth and just invites the con-men and con-women, driven by greed and self-aggrandising delusions to wreak havoc. It also seems the Southerners do not have a monopoly on grand public projects which become scandalised by all sorts of nefarious contracts, management incompetencies and inefficiencies. Take a little trip to Germany, for example. The nation that tells the rest of Europe how to behave! 1. Stuttgart 21 – the “massive new train station project” that is government-owned and hugely over its original budget. The conclusion is that the project is a disaster and was only continued (in 2013) “because it would be cheaper to continue building it than to abandon it”. Please see – Cost Overruns in Stuttgart: German Rail Admits Station Was a Mistake – for more information. 2. Berlin Brandenburg Airport – still to open (although previously scheduled to open in 2010), hopelessly over budget, a perfect exercise in management failure (and more). Bloomberg called it “Germany’s profligate (Greek-like!) fiasco”. Please see – How Berlin’s Futuristic Airport Became a $6 Billion Embarrassment – for a detailed account of ‘German precision’. Not! The original plan was to privatise the airport but that failed after a costly bidding process. Under public ownership, work finally began in September 2006 (after planning started in 1991). Managers have come and gone (either sacked or left after failure), architects hired then sacked and “dozens of other key planners” involved to no end. Some of the technical staff are facing corruption charges. The airport was refused a licence to open due to a lack of adequate fire protection. But a report from the State Auditor in February 2016 revealed that the facilities were dysfunctional. Please see – Flughafen BER: Geheimer Prüfbericht rechnet mit Kontrolleuren ab. The story of how the then manager planned to overcome the lack of fire safety systems in the original design to facilitate an opening in 2012 is hilarious. First, in contradiction of the laws of physics, the architects “planned to funnel smoke – which usually rises – underneath the airport’s halls” (Source). Second, the engineer hired to design the system was “not a trained engineer” at all but was rather a draftsman. He apparently said that he didn’t contradict them when they made that assumption (Source). Third, in March 2012, when the defective fire protection and alarm system was uncovered and the airport was refused a permit to open, the managers proposed a novel solution. In March 2012 the group submitted its stopgap: Eight hundred low-paid workers armed with cell phones would take up positions throughout the terminal. If anyone smelled smoke or saw a fire, he would alert the airport fire station and direct passengers toward the exits. Never mind that the region’s cell phone networks were notoriously unreliable, or that some students would be stationed near the smoke evacuation channels, where in a fire temperatures could reach 1,000F. Ah, those mini-jobs – going up in smoke! It was … an idiotic plan … They thought that this would at least eliminate the need for wiring … because … [the spotters] … could see with their own eyes if there is a mass of smoke lower than 6 feet above the ground. So why did the Germans sign up to bailing out banks exposed to Greek government debt with public money, rather than letting the banks go to the wall, writing out the losses on both sides, and recapitalising them via the administration process? Eight hundred low-paid workers armed with cell phones would take up positions throughout the terminal. If anyone smelled smoke or saw a fire, he would alert the airport fire station and direct passengers toward the exits. Seems like a perfect fit for the JG: labour intensive, almost no training necessary! There is a difference between spending many hours at one’s job and working hard. Pierre, a Frenchman, may spend 1610 (46 × 35) hours per year at his job while Pedro, a Spaniard, spends 1920 (48 × 40) hours per year on his job, but this doesn’t mean that the annual work effort of Pedro is greater than that of Pierre. It is possible, for instance, that Pedro spends a lot more time talking to his co-workers than Pierre does. I’m not saying that this is the case, I’m only pointing out that what the OECD statistics measure is time spent on one’s job, not work effort. Quite right. It’s about productivity – productive output per man-hour. I have worked in both Germany and Italy and there is a world of difference. In Germany we turned up for work at 8.30 and just worked. In Italy I used to have to get off the train at Porta Nuova in Turin and go over to the cafe opposite to slow myself down. That said it was in the late 70’s, now it has changed a lot in Italy and I haven’t been to Germany for 20 years. What the banks are doing to Greece is called fraudulent conveyance. It is quiet clear that the International Monetary “Fraud” is run by the US Treasury which is controlled by Wall Street and the City of London. When you talk of the elites you are talking of bankers. The banks have taken over Europe and intend on asset stripping it until there is nothing left for the people. I suspect that if the banks didn’t control the media the people would have figured our the banking fraud years ago. The banks and the media are controlled by the same people all through the West which is bad for all of us. Also, I learned a long time ago about German engineering. Stationed in Germany in the late 60’s I bought a new VW Beatle. I have never seen anything fall apart so quickly. I will never own another one. Last night we saw on TV Simon Reeve’s travels through Greece. Amongst the nuggets of information there was the statistic that Greece has more Tanks [bought from Germany] than have the military forces of France and Germany combined. He also saw how Greeks refuse to do manual labour and so refugees from Bangladesh are working/ treated like slaves, in the agriculture sector [growing strawberries in this case]. The elite are doing fine – as elsewhere, of course. Somehow one cannot blame Germany for all of this dysfunction. It may seem like it but it isn’t. One of the design criteria of the JG is that it doesn’t compete. And that includes competing with machines that improve productivity. The job of the private sector is to destroy jobs and automate everything. That’s also the job of the traditional public sector – the ‘required’ public services. The JG works in the ‘nice to have’ sector – where productivity and timely delivery isn’t the main issue. I’d better add while maintaining effective delivery – just in case that wasn’t obvious. Corner cutting should be left in the private sector. That’s because labour time isn’t the same as labour services. The transformation of labour power into labour services is largely the function of capital and management. Greece like the UK is one of the few European members of NATO that spends close to or at the 2% of GDP on defence whereas Germany spends 1.2%. This is an area that the Greek government could phase down over time to improve public finances but as a Keynesian I would want to balance this reduction with peaceful investment in infrastructure! Obviously Keynes is a dirty word in the ECM/IMF/Commission who seem to think the Greek economy will improve with regular bouts of austerity which is simply a pernicious form of deflation – or may be they dont care! Point taken. The thought (such as it was) behind my sarcastic comment is that local government already provides an employer-of-last resort function in some jurisdictions, but in a rather ill-thought-out and secretive way. Obviously EOLR and JG are not the same things, but they are related. There is an idealization of German behaviour in Southern Europe, specially in Spain, as if Germans were “beings of light” and if we just were more like them… This apropos that mention to Kantian ethics etc. Don’t get me wrong, I’m pretty happy that corruption is being exposed in Spain in the last times, but we don’t have the monopoly of it or even are specially outside of the norm. But there is this dangerous idea, that if we just removed corruption and had some proper re-distributive taxation or proper public efficiency all our ill-being would be solved as that’s the root of all our problems. Moralistic approaches to economic problems don’t bode well, and that’s one of the problems with all the German PR story for both self-consumption and outsider consumption. But let’s remember, that this idealistic image has been constructed and construed from popular imaginary; the ‘good German’, and it has been played by German elites for a very very long time to force the population to obey and don’t protest, and obey specially the economic policies being manufactured by the different lobbies which have their hands over the levers of power in Germany. Corruption takes many forms and shapes, corruption can be institutionalised and legalised, on one extreme you have the USA, and now the EU, where all corruption is legal, but nevertheless corruption. The worst forms of corruption come in this form and the result are oligarchies and tyrannies which rule over the common good. One of the biggest corruptions in the last century happened in Germany itself, during the unification, when loot was institutionalised and huge fortunes were made during the period, and paid of by the population. Ideological corruption in the form of faux morality and suppression of the works in the name of the false God of ‘competitiveness’ and globalization was born in Germany and is being exported to the rest of the world with the resulting fallacy of composition making it impossible. So let’s talk about corruption, but not only about the minor forms of corruption, but also about the major forms of corruption, the corruption of law itself, to bend the power of the state to private interests themselves, instead of the common good. The proper comparison is with Turkey. Wikipedia tells us it has 1000’s of tanks, some 2800 older M48 Pattons etc. So, no guesses as to why Greece wants lots of tanks.